Dubai, United Arab Emirates, April 16, 2018: Rolling Cones, a premium concept in soft serve ice cream launches in the UAE at the Hyatt Regency Dubai Creek Heights. 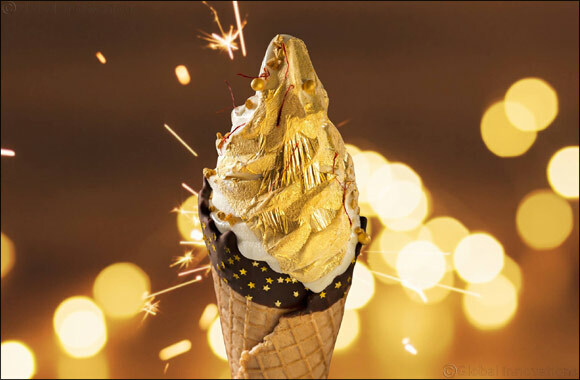 Conceptualized by the dynamic duo, Sunaina Khanna Harisinghani and Prateek Shah, Rolling Cones, a first of its kind desert parlour offers extravagant ice cream and coffee concepts adorned with pure edible gold laced with delectable crunchies and sprinkles of gold dust. With exotic blends to choose from, Rolling Cones introduces authentic taste and creamy texture of ice creams that bring new meaning to rich desserts. Most recommended on the menu is The Rolling Luxury and My Precious, a piece of art created for everyone with most exotic soft serve ice cream flavors on a selection of wafer cones, cups and rolls laced with pistachio sauce and lotus biscuit crumbs. From very diverse backgrounds, Sunaina owns a premier tailoring boutique whereas Prateek is currently the Director at a multi-national technology firm. Rolling Cones is all about superior combinations and signature creations. These exceptionally appealing servings start at AED 33 inclusive of taxes.